PARIS — European leaders struggled Wednesday to reassure the world they were making progress in overcoming the two-year-old euro-zone debt crisis, with German lawmakers approving a proposal to strengthen an emergency bailout fund ahead of an emergency summit meeting later in the day promoted as the moment for a comprehensive solution. 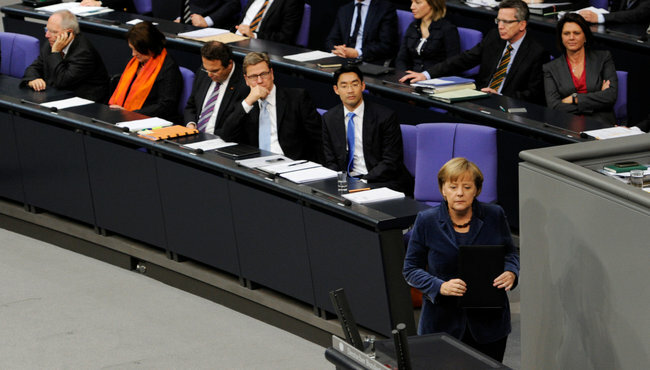 The vote to expand the bailout fund, which passed by a strong margin in Germany’s lower house, came after Chancellor Angela Merkel, in a plea for domestic support, implored lawmakers to overcome their aversion to risk and put the might of Germany, Europe’s strongest economy, firmly behind efforts to get control of the crisis, which has caused economic anxiety and unnerved financial markets far beyond Europe’s borders. Wow! German lawmakers decided to do the “right thing” and sacrifice a huge chunk of their GDP to appease institutional investors who hate the idea of losing their money due to their poor and failing business practices. The only real question remains, is whether Merkel and Sarkozy will hold hands to add emphasis to their “we saved the world” announcement. Key problem: creating a (sorely under-capitalised) bailout fund does not solve the problem of fiscal mismatch. The mediterraneans will keep spending money they don’t have (and never had), bankers will get their payoffs, and the German taxpayer will pick up the cost. Yes — if you love the idea of offering your hard earned capital as a sacrificial lamb to appease the bloodthirsty animal spirits of Wall Street and the bond vigilantes. Fortunately (or unfortunately) the mediterranean predicament is so insolvent that the EFSF just won’t be able to give creditors a haircut-free future. And the ravenous CDS-hounds smell blood (CDS, by the way, is a completely preposterous innovation, effectively allowing investors to take out insurance against other people’s property — as the insurance industry knows all too well this leads to a lot of fires). Just as with Wall Street in 2008, when investment banks and hedge funds naked-shorted each other to hell, a significant segment stands to gain a lot from a huge crash and depression. In 2008 (before I started writing this blog) I called it cannibal capitalism. I still can’t think of a better term. This entry was posted in International Relations and tagged angela merkel, efsf, eurobong, paul krugman. Bookmark the permalink. Theft is theft. This is going to end badly. A crisis may be averted, but the economy will be stagnant for years. The credit score of the Greek Government, and indirectly the people of Greece is zilch. The other membersof Europe have to pay (The public) for the poor policies of the Greeks. This is akin to a flat mate paying for a higher rent bill, because the other flat mate forgot to pay the landlord. Arguments will follow. The cost of borrowing in Greece is going to be high for a long time. Greece is only a few doors from the economic realities of Albania. This will make it difficult for any Debt based Infrastructure or business investment. Investors will be better off going to Ukraine and setting up factories or re-capitalising mines there.